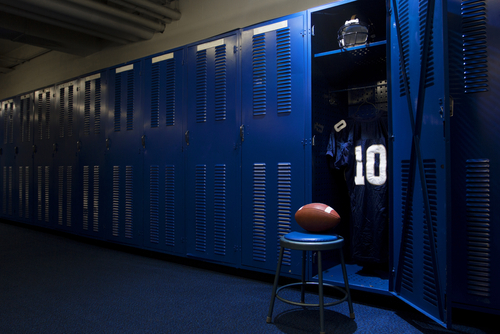 Do your team’s football uniforms leave a lingering stench in locker rooms, even after they've been washed? Do you wish you could save money your cross-country team equipment and apparel budget by not washing your uniforms as often? Antimicrobial fabric provides a solution to both these problems. Antimicrobials (agents that kill microorganisms or stunt their growth) are commonly used against bacteria or fungi. Their use to treat infections stretches back to Greek and Roman civilization. Today, antimicrobial medicines like penicillin are very common. But did you know fabric can have antimicrobial properties too? With antimicrobial fabric, coaches and players can stay healthy and smell good, even in humid conditions or during long games in bad weather. Antimicrobial treatments can be applied to or woven into sports team uniforms, and bacteria and fungi that would otherwise cause infectious diseases or odors are instantly destroyed. Meanwhile, antimicrobial fabric allows your team to enjoy odor-free training environments, benefit from reduced laundry costs, and causes fewer players to get sick in poor conditions. How do antimicrobial fabrics work? Rashes and skin irritation can make it difficult for athletes to perform their best. Hot, muggy conditions will cause players to sweat, and bacteria that stays on clothing will smell and can also result in athlete's foot and other skin problems. Antimicrobial fabric combats microbial growth with a treatment applied to or woven into the fabric that destroys the bacteria and fungi that cause odor and infectious disease. Eliminating odors instantly - Gyms, locker rooms and various training environments will smell much better thanks in part to antimicrobial treatments that instantly kill odor-causing microorganisms. Fewer washes - The cost to keep team uniforms clean can add up, especially if your school has limited available funds. Antimicrobial sports uniforms require fewer washes, which helps athletic directors and coaches save money. It also extends the life of the uniforms and training apparel. Keeping players in the game - Your school can take a proactive approach against athlete's foot, rashes, and skin irritations by investing in antimicrobial team sports uniforms. Athletic directors and coaches have a lot of choices to make when selecting team gear and apparel that fits their performance needs and their budget. Antimicrobial fabric has many benefits, but it is often more expensive. Team dealers can provide guidance, however. Thanks to their deep selection of products and team sports expertise, they can help you choose the best performing, most durable team apparel for your budget. Our free guide for coaches, athletic directors, equipment managers, and parent volunteers offers an in-depth look at many of the performance and quality issues buyers encounter when searching for team gear, apparel, or uniforms. Download it by clicking on the image below.